Remember in my first mukbang where I described my ballet recital and subway dreams? There was another recent occurrence of another very peculiar dream that actually helped bear this entire recipe! I don’t know if dreams occur because they’re puzzles to one’s subconscious problems, or they signify one’s subconscious needs and desires, or for any other reason that has nothing to do with Freudian psychology. But anyways, regardless of the significance of dreaming, here’s what happened in my sleeping brain that ignited this whole post. Okay, so you’re probably wondering what a train in the middle of a snowstorm has to do with this recipe. I pondered on this for a week until I came to the conclusion upon coming back from Sprouts: the oatmeal wagon! For months, I’ve neglected oatmeal. Never touched a grain of oats unless if I made granola. Never made another variation of oatmeal or porridge at all. Never ordered it from another menu. In the dream, the snowstorm basically symbolized the transition from summer to the colder seasons of fall and winter, and the oatmeal train-wagon came back to remind me that I needed to hop on! As for the Bob’s Red Mill conductor, that’s pretty self-explanatory. So to all of you oatmeal-lovers, I am officially back on board with making more oatmeal! One of the most popular pages on this blog lists all of my favorite oatmeal thickeners and volumizers (link here). However, I believe there’s another that has to be added to this list, and that is textured vegetable protein, or “TVP”. Soy is one of the most controversial foods and topics in the worlds of health and nutrition, whether it be the superhero of vegan protein or the devil of breast cancer-causing properties. My philosophy is to take everything with a grain of salt and consume what enables you to thrive. One of the foods that falls into that category for me, personally, is organic, non-GMO soy in many forms: tofu, tempeh, edamame, and the occasional soy protein powder, mock meats and TVP. The reason why I love TVP is because of its texture that mimics ground beef or a porridge depending on how you cook it, its high protein content, its versatility and its simplicity to use. As of now, I’ve been cooking it more on the stovetop since it expands even more than it does in the microwave and yields a much softer, less chewy consistency and less prominent flavor. 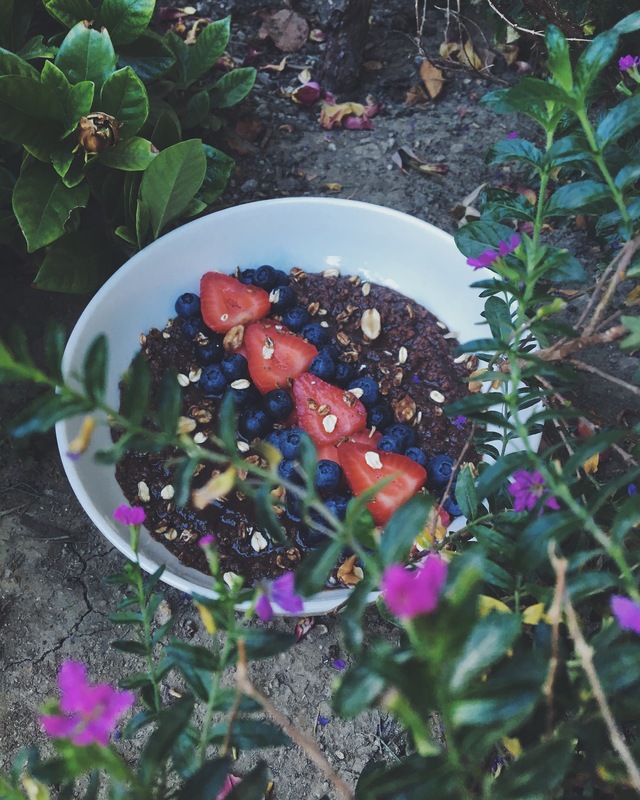 It tastes absolutely wonderful with savory spices, but it blends surprisingly well with oatmeal as well! It increases the volume of the oatmeal, fluffs up the thickness and becomes just as soft as the oats. And of course, I could not forget the chocolate and cinnamon combination that is just too delicious to ignore! This is a great recipe for those who want to sneak in more protein on a plant-based diet. You are free to change the measurements of anything here, but do make sure that you add more or less liquid if you change the measurements of the base as you do not want to end up with runny oats. Optional: chocolate chips, nuts, seeds, peanut butter, almond butter, coconut, etc. Bring the 1 1/2 cups of liquid to a boil in a small pot on high heat. Add the salt into the water. Turn the heat to the lowest setting. Measure out the oats and textured vegetable protein and carefully place into the pot, stirring consistently. Stir in the cacao powder, cinnamon, sweetener and vanilla extract until there are no clumps. Increase the heat to medium and allow the liquid to completely evaporate as the oats bubble up. When finished, serve in a bowl and add toppings if desired. 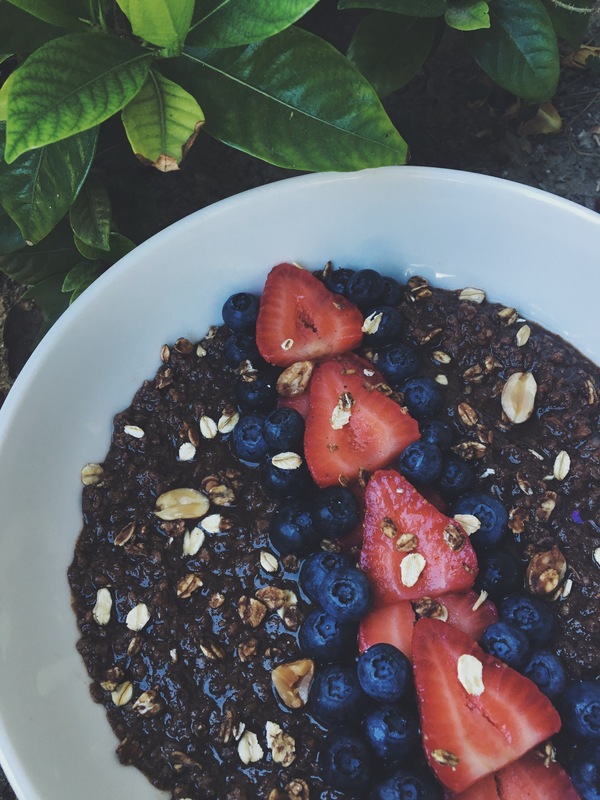 What is your favorite way to have oatmeal? Thoughts on the hot soy topic? I’ve been meaning to try out TVP for a while, maybe this will be my first recipe with it! I don’t really have a problem with soy that’s non-GMO, I just don’t like it that much! There’s only one brand of tofu I really like and even with that, I get tired of it quickly. TVP is wonderful because it adapts anything you put with it, but it does have a pretty acquired texture! It’s usually meant for mimicking ground beef or turkey, but cooking it on the stovetop with a little more water turns it more creamy and soft!